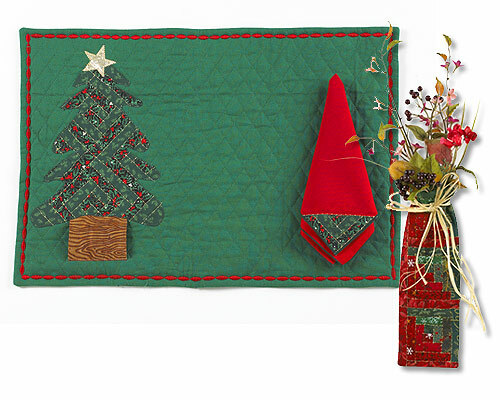 Use the classic log cabin quilt technique to sew a Christmas placemat and napkin set with applique. Make this free Christmas sewing pattern and give as a festive gift this holiday season. Fabric strips for log cabin pattern: three log cabin blocks were made to create the Appliqué tree. 2 strips 1" X 1"
2 strips 1" X 1-1/2"
2 strips 1" X 2"
2 strips 1" X 2-1/2"
2 strips 1" X 3"
2 strips 1" X 3-1/2"
1 strip 1" X 4"
Note: If the base of the tree is wider than 4" add 1" strips on the sides of the bottom square. Sew strips of fabric together to create the log cabin design. 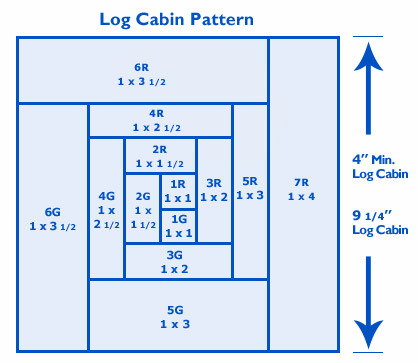 (For complete instructions on the basic log cabin technique, visit www.brother.com.) Create three blocks for the Christmas tree Appliqué. After creating the three blocks sew them together to create one long piece. Position the Christmas tree Appliqué on the placemat front. Pin in place. Create the tree trunk by using a 4-1/2" X 3" piece of woodpatterned fabric. With right sides together fold in half and sew 1/4" seam. Turn to the right side and fold in half again. Slip the raw edges under the tree Appliqué. Stitch tree in place, catching top half of trunk piece. Using contrasting or metallic thread, topstitch along log cabin seam lines - through tree and placemat front. Cut star shape out of scrap of gold metallic fabric. Stitch in place at top of tree. Place the back pf the placemat onto the placemat front with right sides together. Stitch around all four sides using a 1/4" seam allowance and leaving a section open for turning. Press under a 1/4" seam allowance in the open area. Hand sew the opening closed. Select a decorative stitch on your sewing machine and stitch around the placemat 1/4" from the edge in contrasting color. Sew strips of fabric together to create log cabin block. Place the half-block on one corner of the napkin. Using contrasting or metallic thread, topstitch along log cabin seam lines. Finish the edges of the napkin by serging or using the rolled hem foot. Insert the napkin through tree trunk on placemat. For other similar craft ideas, check out this FREE eBook, "The Make My Own Holiday Gifts Guide". Do you like to decorate your table for the holidays? Look no further grab you soe fabric and make your own placemats and cloth napkins. No better way to get exactly what you want. You can use the pre-quilted fabric or quilt you own to save on cost. Great way to use up scrap fabric or fat quarters too. I like this tutorial.